Make mine chrome: Me with the new Royal Enfield Interceptor 650 twin. The Royal Enfield Interceptor 650 twin and Continental GT 650 Twin were the reason I flew to the International Motorcycle Show in Long Beach, Calif. this weekend. Just a little over a week after the new Royal Enfield parallel twins were introduced to the world in Milan, Italy, an example of each was on view to Americans at the Long Beach show. Brave comparison: A restored 1962 Interceptor near the new model. Some Americans I overheard talking found it a bit confusing. 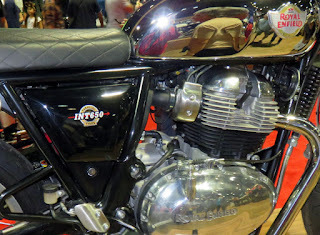 A painstakingly restored 1962 Royal Enfield Interceptor was displayed near enough the new Interceptor that some wondered if both were for sale. That impression was encouraged by the chrome tanks on both. Bright chrome tank of the new Royal Enfield Interceptor 650 twin. The Royal Enfield Continental GT 650 twin. 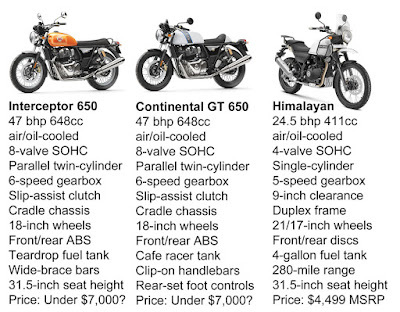 Neither the new Interceptor 650 twin nor the Continental GT 650 twin are currently for sale. The Interceptor 650 and Continental GT shown in Long Beach are "non-runners." 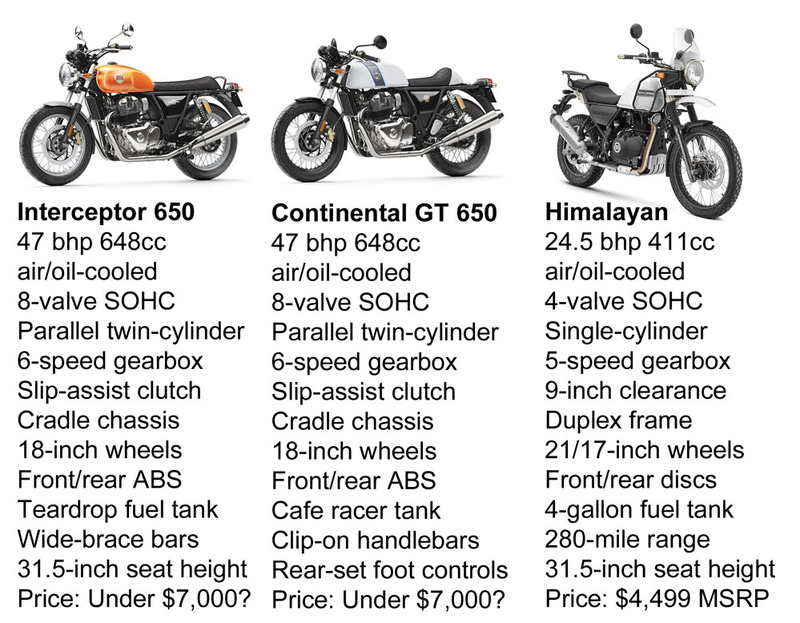 They haven't been certified yet for sale; visitors to the Royal Enfield display in Long Beach were being told that they might be available starting in June — surely an optimistic prediction. I was wowed by the new Royal Enfields, as I expected to be. Luckily my brother Phil, a longtime fan of old Hondas, was along to provide perspective. He praised the new Interceptor 650 as "light looking. You can see through the frame. The frame details are very nice." He admired the straight line of the frame beneath the saddle and the triangle formed by the frame below that. "That's a motif," he said. Phil liked the "heritage" of the chrome tank, and said the chrome looked "flawless." He noted that there is no kick start. We were told that the 650 will "never" get a kick start. On the other hand, the 650 twins have center stands, a great traditional touch and real convenience. He wasn't sure about the gray used on the plastic front fender versus the powdercoat on the motor crankcase versus the "sandcast" look of the cooling fins. He wondered if the wheel hubs were steel, powdercoated to make them look like alloy. Fins of the Interceptor 650 twin look sandcast, not shiny. As for the fins, "you could have hit the ends of them in the mill to make them shiny." A big fan of the air-cooled look, Phil seems to think that every air cooled motor should look like Pratt and Whitney made it for an airplane. To that end, he liked that the "little tiny (oil) radiator doesn't even come into view." It's blacked out between the front downrails of the frame. Phil liked the angular motif of the frame and how the oil cooler stays out of sight. I asked a representative if the slender S&S silencers shown on the 650 twins would be standard and was told "we don't know that yet." If not, they'd certainly make lovely aftermarket accessories. Photo makes the S&S silencer look fatter than it is. It's actually slim and clean. The direct rear-set gearshift of the Continental GT 650 met with Phil's approval, although it looked as though it would force the rider to stretch pretty far out over the tank. Continental GT's rearset gearshift operates directly on the gearbox. For the more upright seating position of the Interceptor the six-speed gearshift operates with the help of a short rod between the shift and its connection to the gearbox. Phil wiggled the assembly with his hand to demonstrate how much slop this introduces. Small auxiliary rod carries shifting action to the Interceptor gearbox. Of course the examples at the show were pre-production motorcycles, with all details subject to change. Phil also found himself drawn to the new Royal Enfield Himalayan on display in Long Beach. Never mind Paris-Dakar; he feels these upright "adventure" motorcycles are perfect for Los Angles traffic. Phil appreciated the tall, narrow stance of the Royal Enfield Himalayan. They're thin enough for lane splitting and unafraid of potholes, and afford their riders a higher view of what's ahead. He happily gave up his name, address and email to register for a chance to win a Royal Enfield Himalayan motorcycle (the drawing will be in November, 2018). "It's labelled an INT650 Parallel Twin in the United States." By the way, as a comment below points out, the new Interceptor 650 is labelled an "INT650" in the U.S. Another manufacturer owns the rights to the full Interceptor name in the U.S. The world press will continue to call it the Royl Enfield Interceptor, I'm sure. ...But in the rest of the world it's an Interceptor 650 Twin. Notice the nameplate on the Interceptor in the California show says "INT650," while the official website photos has it spelled out "Interceptor." Sorry, but "Int650" is what should be on the shipping crate, not the bike. Royal Enfield tells me that another maker has the rights to the full name Interceptor in the U.S., so Royal Enfield can not put it on the bikes in the U.S.
That's interesting, David. I wondered about the "INT650" designation myself. I can believe your explanation.